The first tool you need it a flat 600 grit or so honing stone. You’ll use this to sharpen the inside cutters. Then you’ll need a ceramic cone bit to sharpen the outside rims of any bits that don’t have multiple spurs. Chuck the bit into your drill press, set it to its slowest speed, and follow the original angle of the drill bit. For your multi-spur bits, use a triangular 600 grit diamond file to sharpen the backs and faces of each tooth following the original angle. 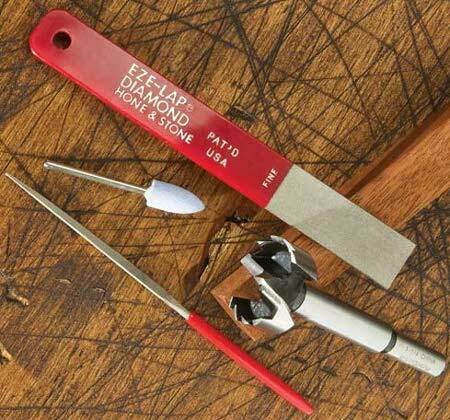 A quick look online revealed three different retailers selling Forstner sharpening kits. All the kits include the flat and triangular honing stone and one or more cone bits to match the various Forstner bit manufacturers. Each one of the kits cost about $18.